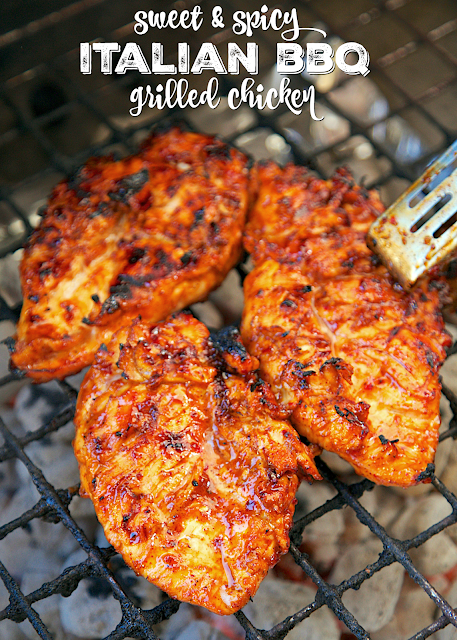 Sweet and Spicy Italian BBQ Grilled Chicken - only 4 ingredients in the marinade! BBQ sauce, Italian dressing, chili powder and red pepper flakes. Sweet and spicy! SO delicious! We make this once a week. Everyone cleans their plate. The chicken is so juicy and has TONS of flavor! We never have any leftovers. This recipe is from a friend. She posted a picture of this chicken on her Instagram account. It looked AMAZING! I had to give it a try ASAP! Joy didn't have measurements for the recipe, so I winged it based on what I thought we would enjoy. O-M-G! SO good! There are only 4 ingredients in the marinade - Italian dressing, BBQ sauce ,chili powder and red pepper flakes. Like most of our chicken marinades, you can marinate this for as little as an hour or up to overnight. We almost always marinate our chicken overnight. It is just easier for me to prep for our meals at night. This is one of the best grilled chicken recipes we've ever eaten. We loved the flavor. It is sweet and a little spicy. We make this almost every other week. We just love it. 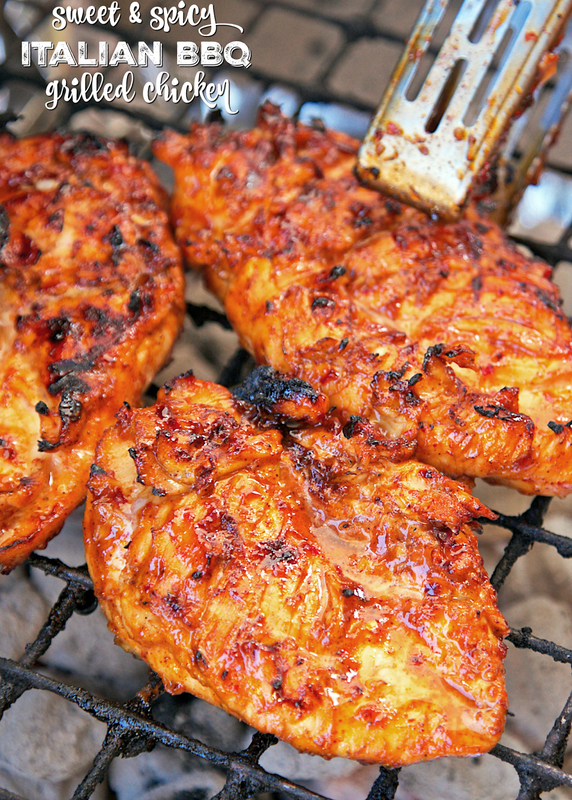 This Sweet and Spicy Italian BBQ Grilled Chicken is on our Memorial Day menu. I can't wait! Thank you Joy! Whisk together BBQ sauce, Italian dressing, chili powder and red pepper flakes. Pour over chicken and refrigerate 1 hour to overnight. Could you bake this also?